Navetta designs and manufactures premier lecture room and auditorium furniture with a focus on striking aesthetics, meticulous engineering and unparalleled value. Navetta’s revolutionary products for lecture halls, seminar rooms, and auditorium furniture have created beautiful and productive environments for colleges, universities, hospitals, and other institutions. Navetta’s history spans 40 years of successful seating solutions and innovations. Navetta provides custom and functional learning environments by understanding your needs, and providing beautiful and well-designed spaces that exceed your expectations. Let us help you create your space! © 2019 Navetta Design. All Rights Reserved. 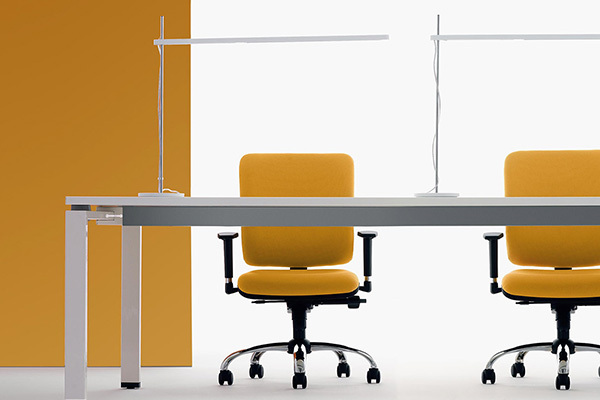 Pedestal: provide table and supports providing fixed work surface with open access, supported by pedestals. Power and Data Distribution System: Modular data and electrical system housed in flexible conduit. All current-carrying power system components shall be UL approved, and will have appropriate labeling documenting that approval. Navetta provides the following warranty to the original purchaser of the above listed Navetta products sold in North America and installed by Navetta-approved installers. This warranty begins on the date of product invoice, is governed by and subject to the terms and conditions detailed below, and is non-transferable. Navetta warrants its products to be substantially free from material defects in materials and craftsmanship. Defects found during normal usage of the product will be covered during the warranty period set out below, provided that written notification of the alleged defect is given to Navetta at the address below prior to expiration of the applicable period. Navetta will at its sole discretion either repair or replace the product it determines to be defective with a comparable product. All other costs are excluded. The fulfillment of the warranty is under the control of Navetta. In the event Navetta fails to repair or replace a product it has determined is defective as provided herein, the purchaser’s sole remedy shall be the return of the purchase price actually paid by purchaser for the defective product on a prorated basis based upon a useful life of ten (10) years. Within ten (10) years of initial shipment: Fixed structural components. Within five (5) years of initial shipment: All other structural components, including seat support arms and pivot mechanisms, springs, tablet arms. Within three (3) years of initial shipment: Plastic components and paint finishes, wood, laminate and other surface finishes (note conditions as to color, grain, and texture set forth below). 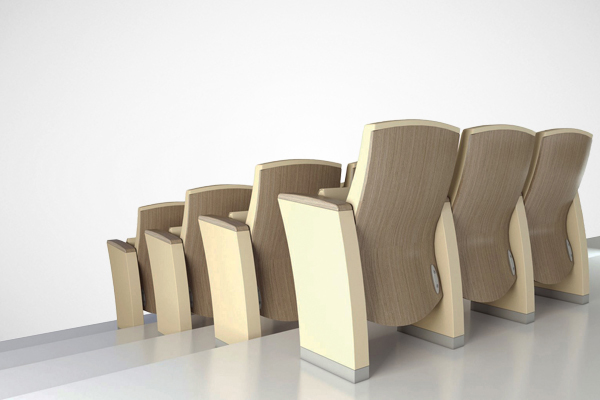 Within one (1) year of initial shipment: Power and electrical components, seating upholstery including foam (note restrictions as to color, grain, and texture below). Conditions other than normal wear and tear. Abuse, neglect, vandalism, or misuse. Products altered or modified by the purchaser. Products installed on flooring that does not meet structural standards. Purchaser supplied or specified material, leather, and non-standard material and color finishes (whether purchased by the purchaser or Navetta). Natural variations occurring in wood and leather and/or color fastness and/or variations in matching of colors, grains or textures of materials. Product color change due to natural aging, UV exposure, cleaning solutions, or other causes. There are no other warranties than those expressly stated above, whether expressed or implied (including, but not limited to any warranty of merchantability or fitness for any particular purpose). Navetta is not liable for consequential or incidental damage arising from any product defect. Navetta’s total liability hereunder shall not exceed the purchase price paid for the allegedly defective product. In no event shall Navetta be liable for any indirect, consequential, incidental or special damages, including lost profits, loss of reputation, loss of goodwill, lost revenue, or any other economic or non economic loss. Pedestal Support – Construction: Pedestals shall be constructed of paired extruded structural aluminum columns measuring 2.3” x 2.2”, with heavy-duty .09” wall thickness and internal reinforcing ribs measuring .20” thickness. Floor mount – Pedestal shall be rigidly mounted to a .25” thick steel base plate measuring 11.5” x 2.5” with four holes for mounting pedestal to floor with anchor bolts. 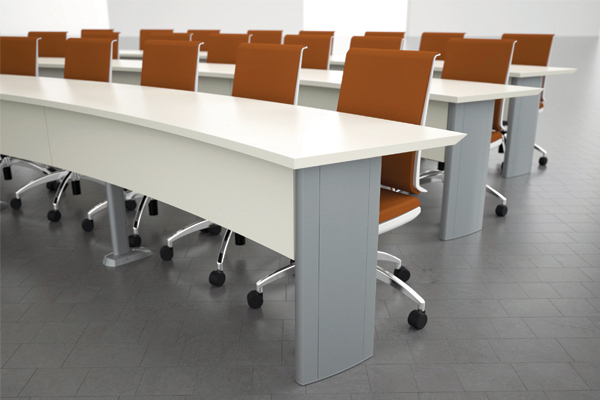 Pedestal Support Side Covers – Floor mounting hardware and top mounting hardware to be fully concealed by two 7.0” wide aluminum extruded removable panels. Table mount – Top mount bracket shall be constructed of .25” thick steel plate with eight attaching screws allowing attachment to pedestal columns. Bracket shall provide four mounting holes for attaching table top and designed to accept optional power and/or data electrical system. Metal Finish – Steel brackets shall have powder-coat finish, aluminum pedestal columns and covers will have anodized finish. Table Configuration – Table tops shall be designed to be assembled into continuous surface in straight, radius, or segmented configuration. Adjacent tops to be joined with two mechanical clamping fasteners. Tops shall have cutouts for tabletop power modules when specified. Manufacturer shall be FSC (Forest Stewardship Council) chain-of-custody Certified. Table Top Construction – Table tops shall be nominal 1.25” thick warp-resistant construction with 1.125” particleboard center core sandwiched between .040” high pressure laminate top surface and phenolic backing surface. Assembly to be permanently bonded under continuous pressure in hot press. Table Top Edge treatment – Edges shall be finished as specified, using 3mm PVC, “T” cross-section vinyl continuous molding, wood surface, or bonded resin edging. Table Top Attachment – Table tops to attach to pedestal brackets with four #14 lag screws. Modesty Panel Construction – Modesty panels shall be constructed of .8” thick nominal particle board sandwiched with bonded high-pressure laminate as specified and phenolic backing sheet, or available perforated metal of specified material, pattern and finish. Modesty Panel Attachment – Modesty panels shall interlock into machined recess in underside of table top surface and attach with supplied rigid metal brackets and hardware. Standard configuration positions modesty panels between pedestal supports. Installation: Install following manufacturers printed instructions for installation and using manufacturer recommended hardware and fasteners. Tables in curbed rows shall be installed at smooth radius. Power and Data Distribution System: Modular data and electrical system housed in flexible conduit. All power system components shall be UL approved, including the steel pedestal table leg used for power entry, which shall be certified as a “UL Recognized Component,” and will have appropriate labeling documenting that approval. Pedestal Support – Construction: Pedestals shall be constructed of 11 gauge steel tubing of oval cross-section measuring 3.15” x 1.57”. Floor mount – Pedestal shall be computer-controlled welded to a .25” thick steel base plate measuring 8” x 4” with four slotted holes for mounting pedestal to floor with anchor bolts. Base cover – Base plate to be fully covered after mounting with two-piece cover constructed of injection molded toughened nylon, attached with two machine screws. Table mount – Top mount bracket shall be constructed of 11 gauge steel with four attaching bolts allowing attachment to pedestal and adjustment for variations in floor surface to provide alignment of adjacent tabletops without shimming tops. Bracket shall provide six mounting holes for attaching table top and designed to accept optional power and/or data electrical system. Top shroud – Top mount bracket will be covered by shroud with rounded edges constructed of injection molded ABS, attached with machine screws. Metal Finish – Metal components shall have powder-coat finish in finish specified. Table Top Attachment – Table tops to attach to pedestal brackets with six #12 lag bolts. Modesty Panel Attachment – Modesty panels shall interlock into machined recess in underside of table top surface and attach with supplied rigid metal brackets and hardware. Standard configuration provides .5” clearance between adjacent modesty panels, continuous configuration optional. End Panel Construction – If specified, end panels shall be constructed of .8” thick nominal particle board sandwiched with bonded high-pressure laminate as specified and phenolic backing sheet, or available perforated metal of specified material, pattern and finish. End Panel Attachment – End Panels shall attach with supplied rigid metal brackets and hardware. The seat and the back are made of 10 mm thick natural beech ply-wood, varnished (available in Class 1 fire-retardant) or padded and upholstered (available in Class 1lM fire-retardant version) with the backrest material in polypropylene. The screws are not-unscrewing and the nuts are self-locking. All metal parts are painted with epoxy powders and the small components are protected by a black zinc galvanizing process. The leg is made of oval tubular steel, dimensions 90 x 30 x 2 mm, welded to an oval steel foot 60 x 30 x 1.5 mm with two nylon little feet. The bearing beam is made of 80 x 40 x 2 mm rectangular steel tube. The frame is made of 25 x 1.5 mm tubular steel. The leg is made of elliptical tubular steel, dimensions 76 x 25 x 2 mm, welded to an oval steel foot, dimensions 265 x 90 x 2.5, with two holes for the floor fixing. The tip-up movement of the seat is mounted on brass bushes and works automatically with a return spring fitted in a polypropylene fulcrum cover. The supports of the seat are made of stamped steel and are 4 mm thick (welded support) or of 3 mm thick (mobile support), whereas the supports for the backrest are in 25 x 1.5 mm tubular steel. The leg is in 89×2 mm tubular steel with foot in polypropylene. The supporting cross-pieces are in 60x30x3 rectangular tubing. The rotational movement of the seat is 1800, with a return spring which acts on a ball bearing. The framework is in 25×1.5 mm diameter tubular steel. They are made with expanded non-deformable resins. The back is 20 mm thick with a 25 kg/m3 density. The seat is 25 mm thick with a 40 kg/m3 density. Fixed chair, swivel chair, or bench with fixed seating The armrests are in black painted steel, 16 mm diameter, the finish on the top is of injection formed polypropylene. The armrests are in black painted tubular steel, 25×1.5 mm diameter, the finish on the top is made of injection formed polypropylene. The anti-panic writing tablet is made of HPL (High Pressure Laminated) material, 8 mm thick, with rounded edges, black coloured; the anti-panic device is aluminium made with a polypropylene cover. Made of 24 mm thick pressed wood, laminate-clad and with rubber edges, both in black; fastened to the beam by a 160×160 mm steel plate and steel omega. Made of light grey, water resistant, pressed-wood laminate 29 mm thick, with rounded edges in black PVC, 120 x 80 cm in size. Made of electro-welded steel wire, 6 mm thick. Seating: Provide modular seating supported by swing arms on either side of each support pedestal, seats to independently swing out for access and swing back adjacent to table top when unoccupied. Warranty period; Ten (10) year warranty on understructure and seating shells (when utilized) from defects of manufacture and workmanship, commencing on Date of Substantial Completion. Inner Pedestal Support – Construction: Pedestals shall be constructed of 11 gauge steel tubing of oval cross-section measuring 3.15” x 1.57”. Inner Pedestal Support Floor mount – Pedestal shall be computer-controlled welded to a .25” thick steel base plate measuring 8” x 4” with four slotted holes for mounting pedestal to floor with anchor bolts. Inner Pedestal Support Base cover – Base plate to be fully covered after mounting with two-piece cover constructed of injection molded toughened nylon, attached with two machine screws. Inner Pedestal Support Table mount – Top mount bracket shall be constructed of 11 gauge steel with four attaching bolts allowing attachment to pedestal and adjustment for variations in floor surface to provide alignment of adjacent tabletops without shimming tops. Bracket shall provide six mounting holes for attaching table top and designed to accept optional power and/or data electrical system. Inner Pedestal Support Top shroud – Top mount bracket will be covered by shroud with rounded edges constructed of vacuum formed ABS, attached with screws. Outer Pedestal Support – Construction: Pedestals shall be constructed of paired extruded structural aluminum columns measuring 2.3” x 2.2”, with heavy-duty .09” wall thickness and internal reinforcing ribs measuring .20” thickness. Outer Pedestal Support Floor mount – Pedestal shall be rigidly mounted to a .25” thick steel base plate measuring 11.5” x 2.5” with four holes for mounting pedestal to floor with anchor bolts. Outer Pedestal Support Side Cover – Floor mounting hardware and top mounting hardware to be fully concealed by two 7.0” wide aluminum extruded removable panels. Outer Pedestal Support Table mount – Top mount bracket shall be constructed of .25” thick steel plate with eight attaching screws allowing attachment to pedestal columns. Bracket shall provide four mounting holes for attaching table top and designed to accept optional power and/or data electrical system. Metal Finish – Steel components shall have powder-coat finish in finish specified. Aluminum components shall have anodized finish or powder-coat finish in finish specified. Inner Pedestal Support Table Top Attachment – Table tops to attach to pedestal brackets with six #12 lag screws. Outer Pedestal Support Table Top Attachment – Table tops to attach to pedestal brackets with 4 #14 lag screws. Seat Support Mechanism – Seat support arms shall be constructed of 11 gauge oval steel tubing formed to a radius, with industry-standard taper receiver to accept chair cylinder. Arms on either side of the support pedestal shall pivot independently from a steel kingpin mounted in a die cast aluminum housing with powder coat finish. A field-adjustable torsion spring shall be implemented to automatically return the seat adjacent to the table top when not occupied. Seat Specifications – A large selection of standard seats are available with the Symmetra Plus system, and virtually any other seat can be used with the system, including plastic, mesh back, and wood construction, upholstered or not, as the customer prefers. See specified seat documentation for detailed specification. Inner Pedestal Support Top shroud – Top mount bracket will be covered by shroud with rounded edges constructed of injection molded ABS, attached with machine screws. Seating: Provide modular seating supported by swing arms on either side of each support pedestal, seats to independently swing out for access and swing back adjacent to table top when unoccupied. Auto-height auto-return seat cylinder allowing seat height adjustment, chair rotation and center return. Height adjustment mechanism and cylinder utilize precision taper fit, which eliminates requirement of tools and set screws. All seats must spin 360 degrees with standard spacing. Shop Drawings: Submit shop drawings showing seating layout, seat-numbering scheme, chair sizes and aisle widths. Must meet all current ADA requirements. Installer Qualifications: Submit certification indicating installer is qualified to install manufacturer’s seating. Must have a minimum of 5 years of experience. Seat Support Mechanism – Seat support arms shall be constructed of 11 gauge oval steel tubing formed to a radius, with industry-standard taper receiver to accept chair cylinder. Arms on either side of the support pedestal shall pivot independently from a steel kingpin mounted in a die cast aluminum housing with powder coat finish. A field-adjustable torsion spring shall be implemented to automatically return the seat adjacent to the table top when not occupied. Must meet static load test requirement of 600 lbs. Auto-height auto-return seat cylinder allowing seat height adjustment, chair rotation and center return. Height adjustment mechanism and cylinder utilize precision taper fit, which eliminates requirement of tools and set screws. Seat Specifications – A large selection of standard seats are available with the Symmetra Plus system, and virtually any other seat can be used with the system, including plastic, mesh back, and wood construction, upholstered or not, as the customer prefers. See specified seat documentation for detailed specification. All seats spin 360 degrees. Inner Pedestal Support Base coverBase plate to be fully covered after mounting with two-piece cover constructed of injection molded toughened nylon, attached with two machine screws.